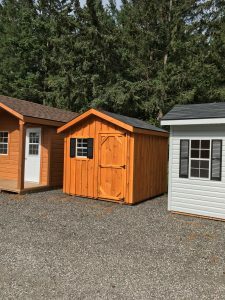 All of our sheds are quality built wooden sheds. 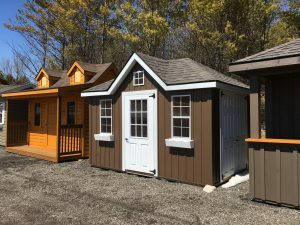 These models are factory stocked or display models that are being sold at discounted prices and fast delivery! 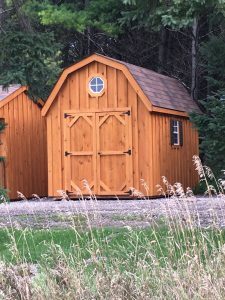 Features: Board and batten pine (stained as seen in picture), Asphalt shingles, Single homemade door on the front, Double doors on the gable end, Octagon window above the front door, two 18×36″ windows with shutters and flower boxes. 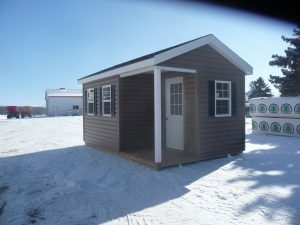 Price $3995 + delivery + HST. 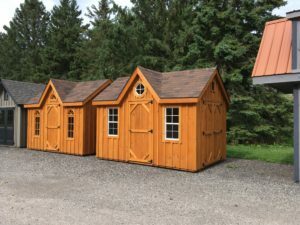 Ready for immediate delivery. 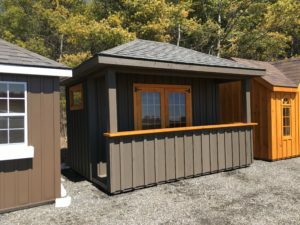 Features: Board and batten pine (stained as seen in photo), Multi-layer asphalt shingled roof, double full glass wooden doors, two 18×36″ wooden windows, and a bar countertop. Price: $7295 + delivery + HST (Ready for immediate delivery). 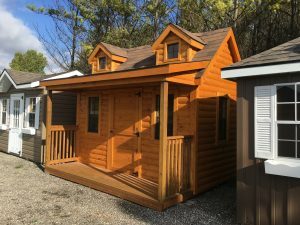 Features: Pre-finished wood siding in natural wood colours, multi-layer asphalt shingled roof, 4′ deep covered front porch, three 24×36″ windows, single man door on the front (with a window), and double doors on the back wall. 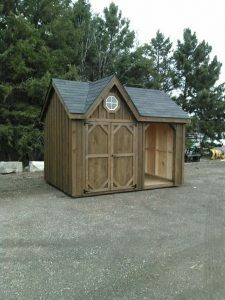 Price: $9395 + HST (Local delivery included). 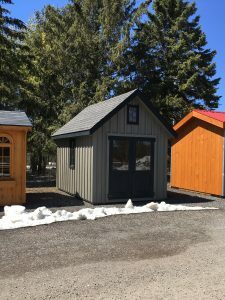 This is five sided corner unit shed, the two back walls measure 10′ long each. 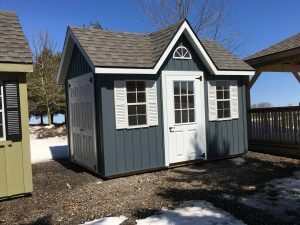 It features: vinyl siding, multi-layer shingles, double french doors, two 18×36″ windows with shutters and flower boxes and an octagon window. $6595 + delivery + HST (Ready for delivery in the fall). 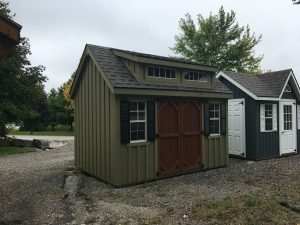 Features: Vinyl siding, Multi-layer shingles, Double fibreglass doors on left gable wall, single steel man door with window, Three 24×36″ windows with shutters and a covered porch. $7995 + delivery + HST (Ready for delivery in the fall). 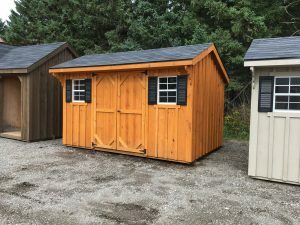 Features: Board and batten pine (already painted), Multi-layer shingles, Double french doors, two 18×36″ windows and one 12×14″ window. Ready for immediately delivery. 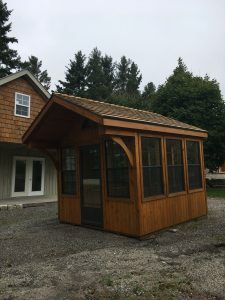 $4195 + HST (Local delivery included). 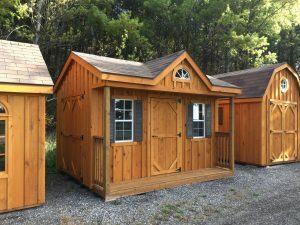 Features: Board and Batten pine exterior, already stained, 5′ wide double wooden doors, two 18×24″ windows with shutters, Octagon window above the front doors and asphalt shingles. $3895 + delivery + HST Ready for immediate delivery. 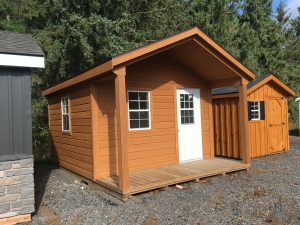 Features: Board and Batten pine exterior, already stained, single pine door, one 18×24” windows with shutters and flower box, asphalt shingles. $2395 + delivery + HST Ready for immediate delivery. 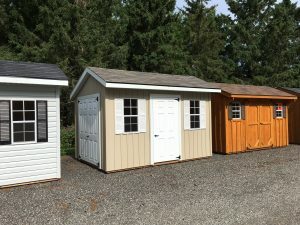 These are fully assembled building so we require good access to your lot. 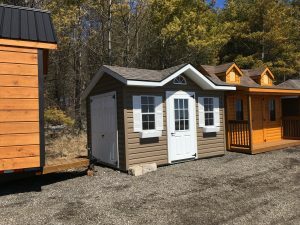 Our terms are: 50% down payment upon order. Balance is due upon completion of delivery. 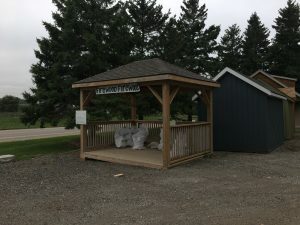 Customer is responsible to acquire any required permits or permission, to provide access to the site, to prepare site and to provide 6-8 patio stones. 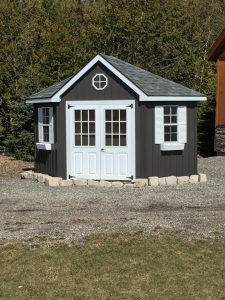 ©2014 Denco Storage Sheds, Inc.